I was in Class 3. Due to some family constraints, I was put in a ‘local’ school close to home for two years, before I went on to one of the ‘bigger’ schools in the city from Class 5. Class 3 is where you more often than not associate a kid with a happy-go-lucky lifestyle without bothering as much. You still are in a nascent phase of your life and do not have a clue of what happens in life anyway. This school that I was in did have a lot of students from the lower economic background and a few of them did go hungry through the day filling their ever-growling tummies with the tap water during lunch and headed out to play. There were many such classmates of mine, and the fussy eater that I was would end up passing on parts of my lunch or at times in entirety to one of those classmates. The reason I mention this is because I have seen at least a dozen of my classmates faint during the physical training (PT) classes which were usually held after lunch. The reason why that happened is not difficult to trace back to. This would in turn mean the student would miss the classes at least for the rest of the day, and at times for multiple days in a row. It is not rocket science that this definitely disrupts the learning of the student. So hunger fuels bad health. Bad health in turn leads to the student missing his classes. This in turn leads to a less-than-perfect learning for the student. This may very well continue to haunt him for the rest of his life particularly considering the impact that education has on one’s career and life. I’d rather be seen as a person of action than that of words. One way that I along with my family has acted on this is by shunning all forms of celebrations for birthdays, anniversaries, and success. We instead contribute to an orphanage closely which though managed well is quite short of funds. Rather than spending a good Rs. 2000 on getting a few pizzas, I’d use the same to feed the 20 kids in the institute three times a day for two days. This has been the case for close to 10 years and we will continue to do so in the years to come. BlogAdda, as innovative as they are, are supporting the AkshayaPatra foundation and I am happy to be a part of this cause since the ripple effect that a mid-day meal scheme for children has is indeed amazing. 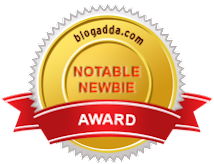 Kudos to you, BlogAdda!